Hawthorn Tree (Crataegus douglasii) – Shapeshift your creative process! When blocks and slowdowns get in your way, stay with the process instead of falling into anger and confusion. Use the magic of clear, intense, spiritually aligned intention to create exactly what you want to happen. I AM spiritual aligned intention to create my life. 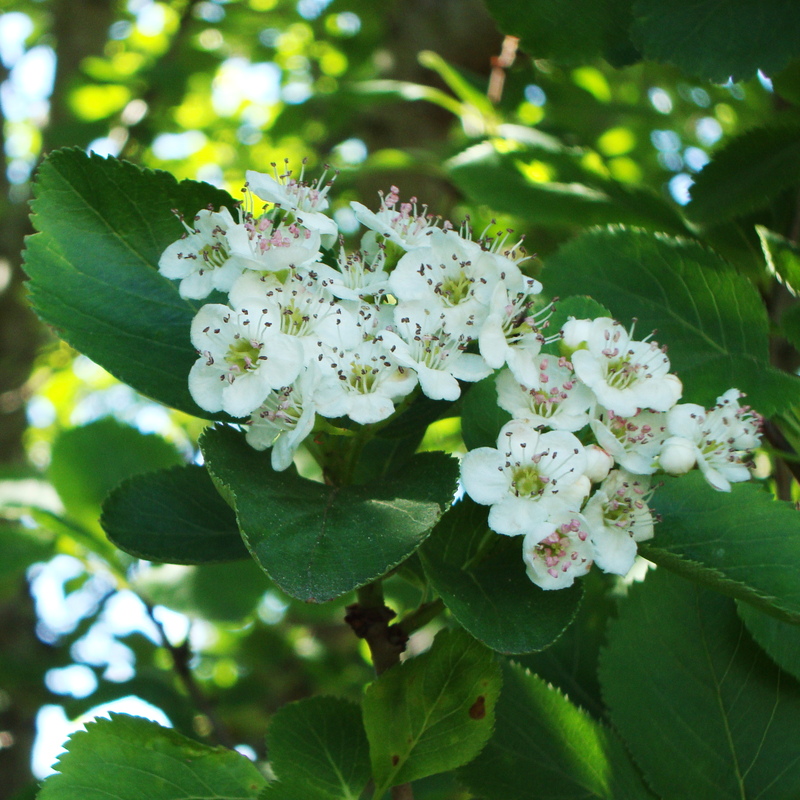 Black hawthorn ranges from southeast Alaska to central Nevada and is common in the western British Columbia, Washington and Oregon. It forms small thickets or can grow to a small (30 foot) tree. Black Hawthorn has 1 inch thorns that jut out from the scaly bark. Groups of flowers with 5 white petals bloom in May to June. Small reddish black “apples” that are a favorite of birds, bears and other animals form in late summer. The thicket provides cover and nesting sites for birds and small mammals. The “apples” were eaten fresh or dried by indigenous peoples. The strong wood was used for digging sticks and thorns were use as pins or fish hooks. Medicines for heart issues, stomach ailments and diarrhea, and teething pain were made from Black Hawthorn. Use Hawthorn Tree Essence when you are stuck in your creative process, especially when confusion, frustration and anger arise, or when you want to give up and quit. Supportive when you want to create something different with your life, but feel powerless to take action. Hawthorn Tree Essence calls you to own your emotional strength to create. It invites you to shapeshift your creative process with clear, intense conviction by raising your frequency to transform anger and frustration into compassionate creative action. Hawthorn Tree Essence reminds you that each experience is a growth opportunity, a way to hone your spirit and your wisdom. Whether you are working on an art, business or garden project, or want to recreate your life, Hawthorn will be your ally. Hawthorn Tree Essence was made by the no-pick method of working directly with the plant spirit. While the essence was being made, a matrix of Amber, Azeztulite, Icosahedron Cut Quartz, Nirvana Quartz, Pink Cobalto Clear Calcite, Rhodonite, Rose Quartz, Sunstone and Drusy Quartz crystals were placed among the plants with the mother bottles. The sun acts as a transformer to step down spiritual energies from higher dimensions. While the essence was being made Amber, acted as a lens to receive and focus sunlight for this purpose. Azeztulite fills your energy bodies with higher vibrational Light of the spiritual realms and allows you to become a beacon of this Light in the world. Icosahedron cut quartz has 20 (5X4) equilateral sides. It is a bridge between the 5th Dimension - the entry into the unified Spiritual realms - and the 4 cardinal directions (N, S, E, W) on Earth. Nirvana Quartz teaches you that situations you experienced as stopping your growth were actually key in tempering your spirit. They helped your unique wisdom to be honed through life’s journey. Pink cobalto clear calcite embodies deeply compassionate, unconditional love and acceptance, while balancing your feeling-oriented and action-oriented aspects. Rhodonite carries the qualities of love, compassion, and generosity. It supports you to recognize and clarify your gifts, and to use them for the highest good in service to others and our Mother Earth. Rose Quartz encourages gentleness, emotional healing, and uniting with the Divine; it shifts your body from a stress-based physiology to a higher frequency Love-based physiology. Sunstone is a stone of personal power, freedom, and expanded consciousness. It warms and stimulates the emotional body, and transforms anger and judgment into joy by raising your vibrational frequency. Drusy Quartz crystals help to energize and stabilize your subtle bodies. The actions of these crystals inform the way this flower essence seats into your body/mind. Raven visited three times to check on the essence making process. He is a bringer of sunlight, shapeshifter and creative magician. Raven brings messages from Spirit that help you shapeshift your creative process and your life.